The bottom-line conclusion of this report is that brand marketers are generally wasting their time and money focusing on social platforms that don’t provide either the extensive reach or the proper context for valuable interactions with customers and prospects. In particular, Forrester’s research has determined that Facebook and Twitter posts from top brands are reaching only about 2% of their followers. Engagement is far worse than even that: A miniscule 0.07% of followers are actually interacting with those posts. Much has been made of Facebook’s recent decision to reduce free-traffic posts on newsfeeds in favor of promoted (paid) posts. But Forrester’s figures suggest that the lack of engagement on social platforms is about far more than just the reduction in non-promoted posts. With Twitter and Facebook being such spectacular duds when it comes to social platforms, what does Forrester recommend that brand marketers do instead? One option is to develop proprietary “branded communities” where fans can hang out in zones where brands can be their own traffic cops, instead of relying on a giant social platform to do the work (or not do the work) for them. 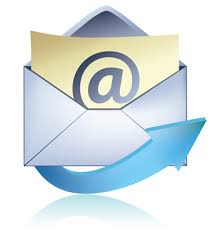 Even better is to return to greater reliance on an old standby tactic: e-mail marketing. 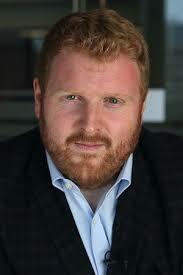 I can’t say that I disagree with Nate Elliott’s position. Now it’s time to hear from the rest of you marketing professionals. How successful have you been in building engagement on social platforms like Twitter, Facebook and LinkedIn? Have your efforts in social paid off as well as in your e-mail marketing initiatives? Let us know. Twitter: The social platform that’s less important today than it was yesterday. Twitter hasn’t mattered to very many people for a very long time. Of course, for some it hasn’t mattered even from its inception. But when we start reading about Twitter’s most avid users and how they’ve begun to drift away from using the social platform like they’ve done in the past … you know that more than just the atmospherics are changing. “We’ve been trying to figure out the moment Twitter turned, retracing tweets to see whether there was something specific that soured the platform. Those are strong words. But the authors back up their assertions by noting that while people may still be using Twitter, many of them are no longer “hanging out” there. And that’s because there’s less “there there” to sustain once highly-engaged Twitter users. The perceptions of Twitter’s value have been changing because of three key precepts which are now being proven out as “fictions,” according to LaFrance and Meyer. The belief that other people in the “Twitterverse” are actually paying attention — or at least that a decent portion of one’s followers are seeing the tweets. The belief that competent and compelling tweeting will increase a person’s Twitter follower base. The confidence of knowing that there is a useful potential audience beyond current followers, so that the time and energy spent on the platform will pay dividends. Twitter is positively stuffed with “spam” accounts. In fact, the median number of followers for a Twitter account is … exactly one. Even if a few of those accounts are actually “legit,” of what value are they to anyone? Twitter’s year-over-year growth rate has fallen significantly since 2011. And here’s another clear indication of how Twitter has morphed into something quite different from its original character. Today, Twitter is more likely to be merely a place to promote content published someplace else in cyberspace, simply providing quick links over to that content. Whereas in the past, journalists and celebs and others were posting statements and opinions — and replying to or retweeting the posts of others — now it’s more likely to be canned promotion and little more. … Which sets up a downward spiral, because followers aren’t seeing anything particularly new or interesting that they’re not already encountering elsewhere. So interest wanes … leading to reduced participation … leading to even less consideration of Twitter’s “worth” as a social platform. This phenomenon of “professionalized accounts” means little more than being a bulletin board of scheduled tweets and broadcast links, resulting in collective yawns all over the place. 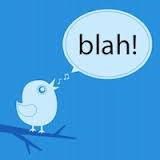 Of course, there’s one aspect of Twitter than continues its joyride unabated: hate speech and profanity. But that’s the sort of content many people would just as soon avoid encountering. It may not be time for Twitter’s eulogy. But there are many who don’t see much of a second act for the social platform, either. By the way … where are those “somewhere elses” in social media that LaFrance and Meyer allude to? Try Snapchat, Instagram … even LinkedIn. That’s where the interesting action is happening these days. With all of the attention marketers have been paying to social media, it’s always helpful to look and re-look at information that gives us clues as to how customers are actually interfacing with brands in the social sphere. Statistics published in a just-released report titled Digital Brand Interactions Survey, based on research conducted by web content management company Kentico Software, gives us a reality check on just how [non-]essential social media actually is in the greater branding picture. Considering how many different brands the typical consumer encounters in his or her daily life (dozens? … hundreds? ), following ten or fewer brands on social media represents only a very small proportion of them. Yet that’s exactly where four in five consumers are when it comes to social branding. These results suggest that the notion that social branding is an easy way to attract new customers may be flawed. 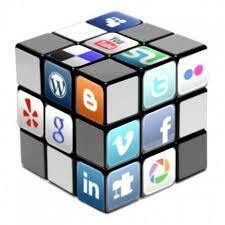 Instead, social branding is better-suited to deepening brand engagement with existing customers. Money talks as well (discounts or other special offers) – and be sure to offer them often. In another piece of evidence that points to social branding’s relatively weak ability to drive incremental sales … Kentico found that ~72% of its survey respondents “never” or “hardly ever” purchase a product after hearing about it on a social network. An equal percentage of respondents have “never” or “hardly ever” had brand encounters online that altered their already-existing perception of those brands. On the other hand, there is also some good news for brands in the social realm: The incidence of people “unliking” or “unfollowing” brands is quite low: Only about 5% of the survey respondents reported such actions. When that does happen, it’s often because a brand has been publishing too many social posts – or the content of the posts themselves is uninteresting. The biggest takeaway notion from the Kentico research is to remind us to maintain a degree of skepticism about the impact of social branding – and to understand that in most cases, social media activities are going to remain the “ornaments” on the marketing tree rather than be the “tree” itself. In fact, that’s probably the case even more now — as consumers become bombarded with ever-more marketing messages from ever-more brands with every passing day. 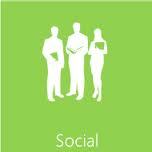 The corporate resource commitment to social media: Plenty of talk … but how much action? With social media activity seemingly bursting at the seams, it’s also risen near the top of many marketing departments’ punch lists of tactics to reach, engage with and influence their customers and prospects. But when it comes to putting serious resources behind that effort, how much of a commitment is really there? For the distinct minority of companies that have seen fit to devote some degree of dedicated personnel to their social media program, nearly 85% of them have created teams of three people or fewer … and in more than 40% of the cases, it’s just a single individual instead of a team. As to whether we’re on the cusp of something much bigger in terms of resourcing social media activities, this isn’t evident much at all from the future plans of the businesses surveyed by Ragan. When asked whether companies had expanded their social media personnel assignments during 2012, fewer than one-third of the respondents answered affirmatively. … And the trend doesn’t look much different for 2013, with more than three-fourths of the respondents reporting that there aren’t any plans to hire additional social media practitioners this year. What about interns, that fallback position for cheap and easy labor? Fewer than one-fourth of the respondents reported that interns are employed by their companies for social media tasks. Most others believe that using typically inexperienced interns for the potentially sensitive customer engagement aspects of social media is a “non-starter,” as they consider those sensitivities to be a disqualifying factor. And in the cases where interns do help out in social media efforts, the vast majority of their activity is confined to Facebook and Twitter, as compared to LinkedIn, blogging,creating online “thought leadership” articles and the like. How satisfied are companies with how they’re doing in the social media realm? According to this study, there’s rampant dissatisfaction with the degree to which companies feel able to measure the impact of social media on their sales and their businesses. The tracking mechanisms put in place by companies range the gamut, but it’s not clear how convinced practitioners are that the information is accurate or actionable. The vast bulk of tracking activity happens using in-house mechanisms or free measurement tools (~59% use those), although the paid measurement tools offered by HootSuite and Radian6 do have their share of users. The takeaway from the Ragan/NASDAQ research is this: Company staffing and resource allocations have a ways to go to catch up with all the talk about social media. Chances are, those resources will be easier to allocate once proof of social media’s payback potential can be shown. But that might take substantially more time to prove than some people would like. As if to underscore this notion, statistics compiled by IBM researchers covering the past holiday season found that less than 1% of all online purchases on Black Friday emanated from Facebook. The percentage of purchases from Twitter was even lower — undetectable, in fact. And similarly paltry results were charted for the rest of the 2012 holiday season. As long as social media marketing continues to contribute such pitiful sales revenues, get used to seeing scant social media budgets and near-zero increases in dedicated human resources. What do you think? Is Mr. Hatch onto something … or is he just reaching for dramatic effect? Share your own thoughts if you’d like. Does Gartner’s “Hype Cycle” Chart Apply to Social Media? 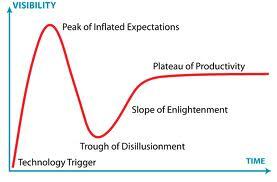 As can be seen in the diagram at right, the Gartner “Hype Cycle” model begins with a technology trigger that generates a groundswell of interest and expectations, which is then followed by a crash when the early expectations fail to pan out. It is Mr. Molander’s contention that the characterization of social media as a “game-changing” phenomenon has been so overstated and sensationalized, most companies today are probably working against their own best interests in how they’re dealing with it. Which is to say, not using it properly as a selling tool. The companies that are successful in selling goods and services via social media are promoting interactions in ways that answer questions and solve problems. Of course, there is absolutely nothing new or novel about this: “Solving customer challenges” has always been an effective way to cultivate AIDA (awareness, interest, desire and action). It also continues to be the best way to move customers toward making a purchase. What social media can do is make the process easier to accomplish, due to social’s interactive nature. Approached in the proper way – and done with regularity – facilitating digital Q&A interactions will help leverage and drive sales. I think Mr. Molander’s point of view is correct. Using social media as a platform for sales isn’t about some kind of “secret formula” for content creation or figuring out the ideal time to publish a Twitter tweet or blog post. It’s about using the “new” platforms to facilitate “old” sales concepts. You know – the ones that work. Share prices of Facebook stock have been distinctly underwhelming since the first day of trading — to the tune of ~30% off its original offer price. And everyone seems to have an explanation as to why. I’m partial to a list of reasons put out by Dan Janal, president of PRLeadPlus.com and author of the business book Reporters Are Looking for You. The public is not as dumb as Wall Street thinks. Chalk it up to too many other dot.com “can’t miss” opportunities that whiffed big-time. Friends aren’t really “friends.” Indeed, many Facebook friends are more like acquaintances, which is a lot less compelling when it comes to word-of-mouth influencing. (LinkedIn connections are far more “honest” in terms of being “all about business.”) When Facebook contends that friend networks will influence more buyers, investors look at their own friend networks … and they don’t buy the hype. There’s a huge gulf between Facebook “friendships” and actual “engagement.” And if friends don’t engage, a big piece of what makes the Facebook power matrix potentially so potent falls away. Sure, the early investors who acquired stock options early in the game came out big winners. But precious little of that largesse turns out to be in the cards for the rest of the investors. “Fanning out” when it comes to brands and social media engagement. Social media may well be taking the famous 90-9-1 principle of online engagement … and bringing it to new lows. It’s hard not to come to this conclusion when reviewing the results of research conducted by the Ehrenberg-Bass Institute for Marketing Science. This Australian-based University think-tank studied the actual engagement levels of people who have “liked” the top 200 brands on Facebook by considering the degree to which fans actually shared posts or commented on the brand. Over a six-week period of study, Ehrenberg-Bass found that fewer than one half of one percent of the brand fans actually “engaged” in any way at all. The conclusion? It turns out that social media fan bases and actual engagement are two very different things. Categories that do somewhat better in “engagement” are ones like alcohol, cars and electronics. But interestingly enough, the study also found that the so-called “passion” brands – such as Harley-Davidson, Porsche or Nike – don’t perform much better than “regular” brands: 0.66% engagement versus 0.35%. In its report conclusions, Ehrenburg-Bass questions whether the Herculean efforts being made by some brands to “bribe” their way to thousands of “fans” and “likes” is really worth the cost in terms of the added product discounts, coupons and other goodies that are being proffered to entice consumers to become brand fans. When you boil it down, the Ehrenburg-Bass research confirms yet again a basic truism about branding: Much as we would love to think otherwise, the marketplace isn’t nearly as enamored with our brands and products as we think they should be. To us, the branding so important. To them … it’s just one big shrug of the shoulders.